One method used to infect Windows PCs is through malformed/malicious HTML content stored inside emails (and in most cases hidden.) Because of this, one of the first things I do after installing Microsoft Outlook is set the client to convert all received email to Plain Text. 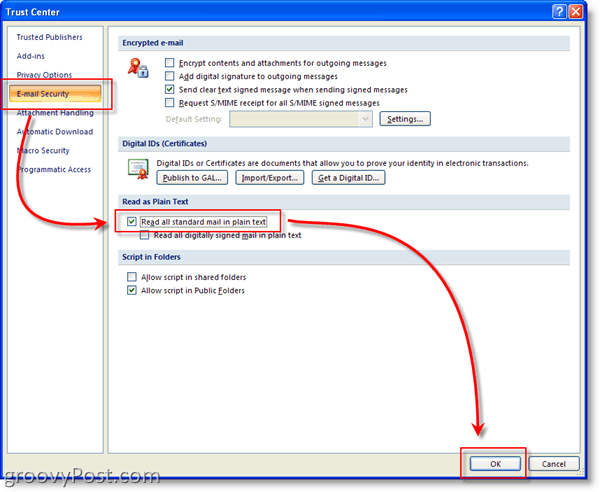 The setting in Outlook 2007 is “Read all standard mail in plain text.” Enabling this feature not only helps secure your desktop against malformed or malicious HTML (who wants to get hacked right?) but it can also contribute to protecting your privacy. Especially so in regards to marketing emails/spam with embedded HTML linkbacks to Web Sites that track all kinds of marketing data about the person who opens the email. Slimy eh? That’s it! All done! Groovy eh?? Oh you have no idea how happy I am to find this post. Thank you!!!! WELCOME to the site and thank you for the feedback. But can u tell me how to do in Outlook 2003?? Wow…huge thanks. Why is this no longer to be found in “Options”? Sigh…life is so much more pleasant without html defiling my inbox. @Robbie – Welcome to the site! All done! If I get time I’ll write this up with screenshots for ya. Can I post a question here? @Alvin – Thanks and welcome to the site! That way our entire community can join in on the discussion and get your question answered! Thanks for the great tip ! How do you copy multiple emails to multiple text files within a folder ? Hope one of those help you out. 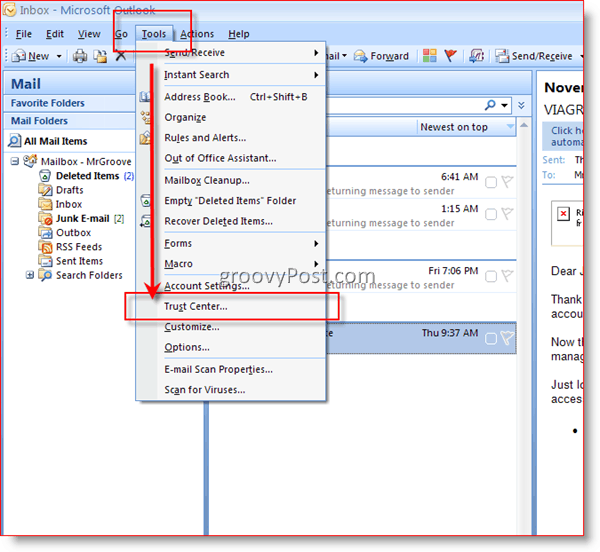 How to I turn off microsoft outlook feature that automatically send the email after spell check? @Chris – I’m thinking you have your Outlook client set to Spell Check emails before the email is sent. What that does is when you hit SEND, it will spell check the email. After spell check is done it will then send. I don’t think there is an option in Outlook to SEND an email if you don’t hit send. Make sense? If that’s not the case you should post your question under the “OFFICE” section in our free tech support Forum and post a few screenshots with your config. Now I can see everything in plain text, but where pictures were now it shows the entire link/path, is there a way to hide all hiperlinks from the email body? I need to remove that for a friend that is blind, when he reads the document with an special software it starts reading the whole path. Maybe a dumb question but will using this setting save space in my inbox? Actually — a good question! Thanks for the quick response and good info. I’m trying to figure out a workaround for the dreaded email inbox quota. Any ideas are welcomed and appreciated.